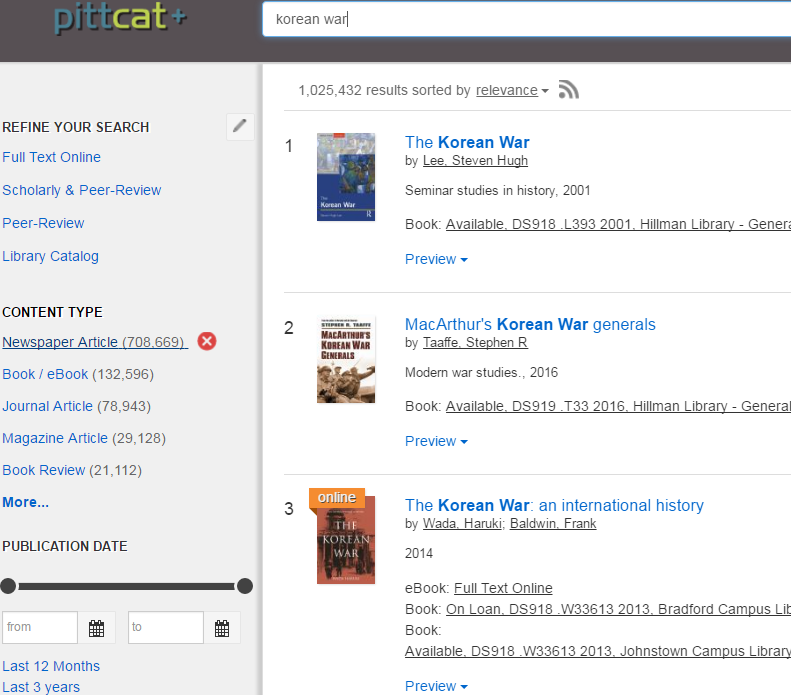 PITTCat+ is the online library catalog for all the libraries within the University of Pittsburgh Library System. This guide is designed to help students locate books and other materials that the library owns or has access to using the online catalog. In basic search mode, you can search using one text box which is similar to how you would search using any online search engine (e.g Google). Advanced Searching allows you to refine your search beforehand. This can easily save you time if you already have an idea of what you are looking for. Learn to refine your search results to find exactly what you need. Learn how to manage your results once you find something you like. Get answers to some of the most frequently asked questions sent to our Librarians. In this box, you should enter your search terms and click on the Search button. The results of your search query will be displayed in a results listing like the example below. The Result List will include articles, books, e-materials, and images. Click on the title of an item for more detailed information about the item, such as an abstract or the shelf location for a book. For articles, if full-text content is available, you can get the full-text by clicking on the item title or the "full text online" link.